This is the fourth Inspector Gamache book, set in the week leading up to Canada Day (July 1), and the Gamaches’ wedding anniversary. I’m glad I remembered when this one was set, because visiting with Gamache always tends to improve the spirits, and its ben HOT here and driving around in the car listening to Ralph Cosham while the AC did its job was a wonderful way to break up the day. Unfortunately, I felt like this was the weakest thus far of the Inspector Gamache books. Let’s go Pro/Con style as to why I landed on 3 stars for this book. It continues to be refreshing to read about a detective who is also a family man and a good person. So many detective stories feature scarred men (or occasionally women). But not here. Inspector Gamache is a lovely man who is celebrating his wedding anniversary with his wife whom he still loves deeply. The other characters are intricately drawn, even if they don’t always land. How. When an author writes a seemingly impossible murder they have to make sure they have a plausible and interesting explanation. Penny nails it. Dialogues and conversations. Penny has an ear for how people speak to each other and inner monologue (even if some of her characters are incredibly well spoken). Historical Details. Penny highlights the tensions between Francophone and Anglophone Canadians focusing on the “Quiet Revolution” of the 1960s when English-speaking residents of Montreal felt alienated and many left the province which had become officially French-speaking. Penny also highlights the class divisions that the two languages demarcated at the time, and the lingering classism. We learn about Gamache’s personal history and his father’s involvement in protests to World War II. But perhaps the favorite for me was Gamache’s lessons on Rodin’s “The Burghers of Calais”. Setting. 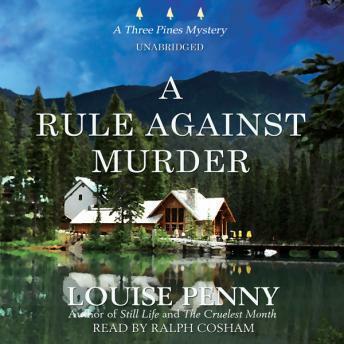 We weren’t actually at Three Pines, where I want to be when I pick up an Inspector Gamache book, because the cast of characters there are so enjoyable. At times during the bookI wished that I was with Reine-Marie at the practices for Clogging Competition instead of being at the Manoir Bellechasse with the irredeemably awful Finney/Morrow clan. The interactions between Beauvoir and the Chef, or Elliot and the Maître d’Hotel left me cold and confused, and made me miss Gabri and all the rest even more. Plot. It’s basically a locked room mystery, which isn’t always my favorite, and is harmed by the following two points. Pace. What bothered me is that the killer is among them and yet no one is in a hurry to catch the killer. There is no sense of urgency, until the very end. Like the other books in the series, about half of the book has absolutely nothing to do with the murder. In the previous books the time away from the murder filled out the world surrounding Three Pines, the Sûreté du Quebec, or the Arnot case. This time… not really. Reason for Murder. While the how worked for me, the why was a big mystery. I was baffled by the motive for the murder. The murderer’s reason did not convince me: was it a crime of passion? But the incident that triggered the murder was a long time ago and the victim didn’t have anything to do with it. Was it then a crime of opportunity? Or premeditated, because the manner of death took planning? There is no satisfying answer to these questions. With all of that, I’m still happy with the series and will be picking up the fifth book in the series, The Brutal Telling in the autumn. Sometimes, a book shows up and you read it knowing full well it isn’t for you. This, friends, is one of those books. I’m participating in Book Riot’s Read Harder Challenge again this year since I’m usually looking for an excuse to read something different and I have been trying to expand my tastes. One of the challenges, number one in fact, is to read a horror book. Fear was struck into my heart because I don’t even watch horror movies, let alone read horror books. Enter my friend Alison, who suggested this award winning YA horror novel to “ease” me in. If she wasn’t my friend, and there wasn’t a check mark waiting for me at the end, I would have put this book down within about 20 pages and never returned to it. 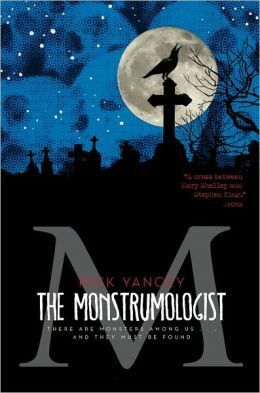 The Monstrumologist is the first in a series by Rick Yancey, published in 2009, and its genres are listed as YA Horror and Gothic Horror. I get it, and the horror portions were not too much for me, probably because of the YA categorization. The book hinges on the idea that it is the diary of one of the main characters found after his death, chronicling his apprenticeship with the titular monstrumologist as they investigate the case of an infestation of Anthropophagi (please don’t ask me to explain these weird monster creatures with no heads and mouths in their abdomens) in their area. As I mentioned above, I did not enjoy this one. The writing was fine, if a bit longwinded. The characters are relatively well drawn, but I cared for not a one of them, even the child. Obviously this book works for some people as it won the 2010 Michael L. Printz Award of the American Library Association for young adult literature, but not me. I would suggest the Jackaby series instead, and think I probably could have used that book to check off my horror task, even though it didn’t feel scary to me. I am leaving A Head Full of Ghosts by Paul Tremblay on my to reads list, and we’ll see if I manage to get there. I have a slightly OCD reading rule: series must always be read in order. Reading as many romance novels as I do (rough estimate is 13 out of 43 so far this year), this has proven a useful rule since series tend to build on each other. Then, CBR’s very own crystalclear read and hilariously reviewed Any Duchess Will Do and I asked to borrow it, because I could, and ended up reading the fourth novel of the series before having read any of the others. Which brings us to now. I really liked this book, and while I wished I was more familiar with Spindle Cove and its inhabitants I didn’t feel like I necessarily liked it less than I would have otherwise. It was a remarkably strong reforming of a rake story and while Dare tends to push the limits of believability (you will never come across a review titled “the recognizable 1840s” from this author), I was all-in with these wacky people (not kids! Grown-ups!) and their shenanigans. Griffin York, the Duke of Halford, has no desire to wed this season—or any season—but his diabolical mother insists he select a bride from the ladies of Spindle Cove. He chooses the serving girl. Overworked and struggling, Pauline Simms doesn’t dream about dukes. All she wants is to hang up her barmaid apron and open a bookshop. Her duties are simple: submit to his mother’s “duchess training”… and fail miserably in order to earn a thousand pounds. But, Pauline isn’t a miserable failure. She’s a brave, quick-witted, beguiling failure—a woman who ignites Griff’s desire and soothes the darkness in his soul. Keeping Pauline by his side won’t be easy—can a roguish duke convince a serving girl to trust him with her heart? I also think I managed to put my finger on why I had struggles loving Secrets of a Summer Night as much as some of our other romance readers… I was not having it with the mother’s storyline. Yes, it’s accurate and believable to the time period and an important plot point in driving home our heroine’s motivations, I just didn’t want the incessant weight of it in the novel. This story’s mother character is much more my personal speed, particularly right now. She has her own motivations, history, and personality quirks, but she is moving the story forward as a full character in the plot, not just as a sign post of woe. While I know not all of the Spindle Cove books are as strong as this one, and they couldn’t possibly have such a delightful main pair, I simply don’t believe it. But I believe in the power of reading to find out.